Did you know there is a 25% chance your cause of death will be due to environmental pollution? According the World Health Organization, some 12.6 million people—or nearly 1 in 4 worldwide—died in 2012 due to living or working in unhealthy conditions. In addition, environmental degradation seriously affects overall quality of life and the balance of Earth’s ecosystems through loss of forests, open spaces, marine environments and biodiversity. While technological growth and industrialization historically contributed to such problems, the latest technologies—from robotics to artificial intelligence to biotechnology—will also help create healthier and greener industries benefiting both people and planet. While affordable electric and hybrid cars will help reduce pollution and use of fossil fuels, self-driving cars will make our whole transportation and logistics systems more efficient. Cars, trucks, ships, drones and jets that drive or pilot themselves and wirelessly communicate with each other can coordinate and optimize delivery of people and goods in ways requiring less energy. Depending how the system rolls out, at the least, individual car owners could see 15% fuel savings simply through more efficient driving habits. Car sharing (resulting in less cars overall), the platooning of delivery trucks, and integrated transport networks (where cars no longer need stop signs or stop lights) may lead to even more dramatic savings. This self-driving future is coming fast. Eleven companies are now testing self-driving cars in just California. 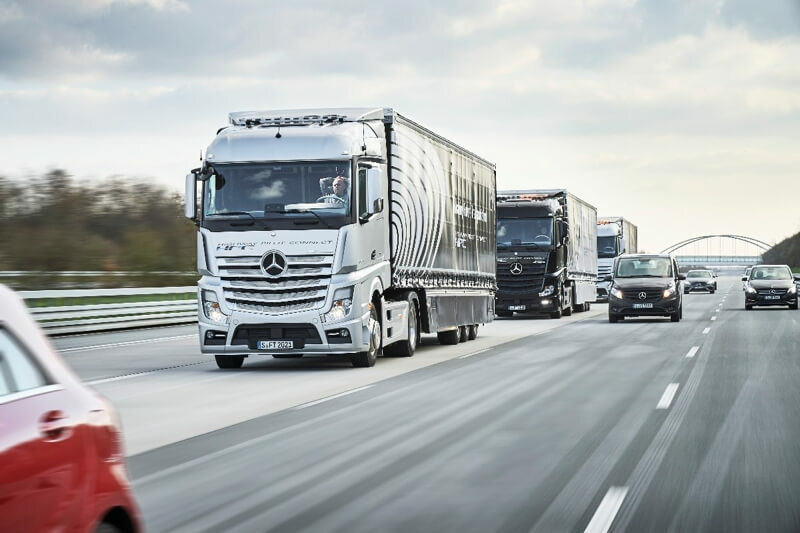 New self-driving car initiatives are launching in heavily polluting countries like China, several convoys of self-driving trucks recently completed a 1,000 mile platooning drive across Europe. Eventually systems like these will also include drones, cargo ships, and smaller delivery vehicles. In addition to transportation, exponential technologies can also green the world’s agricultural industry, another big polluter that is also responsible for loss of forests and biodiversity. Japan is opening a series of robotic vegetable farms, including Spread, which will harvest up to 50,000 lettuce heads per day. 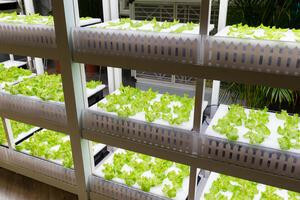 By using LED lights and operating in self-contained environments robotic farms like Spread can reduce energy use 30%, reduce water use 98% (through recycling), and do not require chemicals and pesticides. Shelves of indoor hydroponic lettuce. By planting on shelves and stacking them vertically, these farms also reduce land use, allowing island nations like Japan to become more self-sufficient in their food production and other nations to use their land more wisely. In addition to vegetables, biotechnology is producing environmentally friendly lab-grown meats. Lab-grown meats use stem cells and bioreactors to grow meat rather than raising and killing animals. Animals in the meat industry are estimated to consume 30% of the world’s grain, 25% of land use,and are major contributors to pollution. 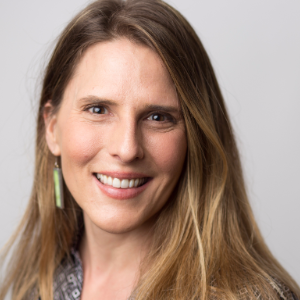 While these technologies offer hope for a greener future and greener industries in the next decade, it will still be a few years before they are operating at scale around the world. In the meantime, exponential technologies are also addressing more immediate problems. IBM recently rolled out an artificial intelligence platform to predict, monitor, and manage air pollution in China, and early stage innovators are looking for ways to allow individuals and families to use artificial intelligence to monitor air pollution in the home. Researchers are developing intelligent sensor networks and robotic fish to find and identify sea pollution early on. In the past, researchers were only able to test water at most once a month. These real-time sensors allow fast detection and management of spills before they spread. Innovators in wildlife conservation are also testing robotic animal decoys to prevent and catch poachers, virtual geofences to protect endangered birds from wind turbines, and big data analysis to prevent illegal fishing. While all of these developments are promising, one of the most challenging aspects of the coming decades will be implementing these technologies in a thoughtful way. New technological innovations are still largely first taking hold in the developed world. Unfortunately, environmental pollution is now the leading cause of death in the developing world, coming from such sources as indoor cook stoves, second-hand smoke, and waste run-off from factories. Furthermore, the solution to one problem may create new challenges. As we transition to greener industries, we need to do so in a way that considers moving the billions of people who are dependent on the old industries and economies into new sources of livelihood. For example, while more automated farms may help solve an environmental challenge, they may also destabilize up to 40% of people in the developing world who are dependent on agriculture for their livelihoods. Similarly, though self-driving technology may increase efficiency, millions of professional drivers may also lose jobs in these industries. And as we switch from oil to new sources of alternative energy, oil-dependent countries—such as Saudi Arabia, Russia, Venezuela, Libya and Kuwait—will need to begin diversifying their economies or risk serious economic pressures with geopolitical consequences. Those who study the environment understand how closely human survival is linked to the well-being of our natural ecosystems. But we must also remember that in our deeply connected world the well-being of one community is also dependent on the well-being of other communities, and we’ll need to collaborate now to ensure the future works for everyone.